A higher res version can be found can be viewed from here (23Mb). Note the movie uses the DIVX codec. 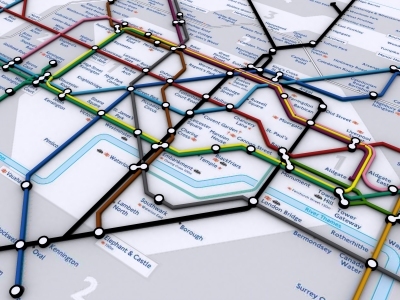 A 3D representation of parts of the tube network with interconnecting tunnels and street exits would be brilliant, and also really helpful for commuters to identify easier routes. I wouldn’t have thought it would represent a security issue as you wouldn’t outline security lapses or areas not covered by CCTV. Please persue the idea, if only concentrating on the Kings Cross area, it’d be fascinating!! How can I obtain this 3D file? I guess you could work out the layout of stations just by walking around them and taking notes – might get you arrested though. Alternatively, just a good memory would do – I’m sure some people know the stations well. Keep pressing – I love the Tube and a genuine 3D representation would be brilliant. Don’t forget The Way Out Tube Map is avilable in good old fashioned paper form!